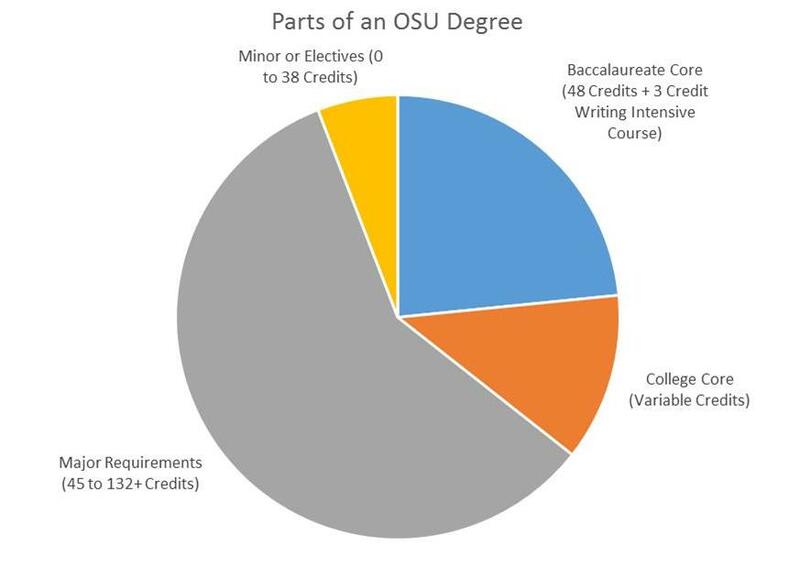 Every OSU student must complete at least 180 credits, which is equivalent to 120 semester credits. OSU is a quarter system, meaning we have four, 11 week terms or quarters in an academic year; summer, fall, winter, and spring. When transferring in course work from semester system, multiply the number of credits by 1.5 to see how many quarter credits will be transferred (3 semester hours x 1.5 = 4.5 quarter credit hours). If you are planning to transfer OSU credits out to a semester system multiply the number of quarter credits by .67 to find out how many credits will transfer (4 quarter credit hours x .67 = 2.68 semester hours). This is a rough estimate and each university may be slightly different. Be sure to check with the university you are transferring to ensure that they will accept the credits. must complete a total of 48 credits plus a Writing Intensive Course (WIC) of at least 3 credits. some majors will specifiy which classes you need within the Bacc Core. the exact amount of elective credits a student needs depends on the courses students choose to complete their major and bacc. core requirements. Your OSU academic advisor will help you understand all of these components once you are a student!